The Cassida UNO uses powerful infrared (IR) technology to authenticate infrared security features present on authentic currency and make them visible to you. IR markings cannot be seen with the naked eye and have yet to be counterfeited, making IR one of the most advanced security feature of today's currency. All newer U.S. bills have identifiable IR markings, making your job of detecting counterfeit bills easier with the Cassada 2230. American bills have a variety of unique stripes that are invisible except when viewed under the lens of the Cassida 2230. Steel-constructed and of compact design it easily accomodates to any busy cash-handling station. Its pivoting head makes it easy for the operator to get a good view, whether seated or standing, and without getting in the way. Counterfeit detection is easy with the 2230, just look for the bill stripes and you'll know instantly. Specifications: Verification type - IR detection; Display type - high resolution LCD; Weight - 1.1 lbs. ; Dimensions - 4.74" x 5.25" x 2.75"; Power input - 110-220 VAC 50-60HZ. 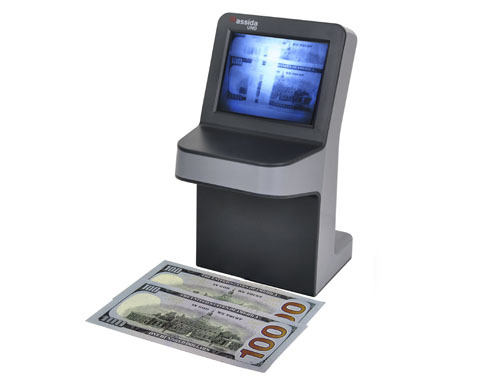 The Cassida UNO uses powerful infrared (IR) technology to authenticate infrared security features present on authentic currency and make them visible to you. IR markings cannot be seen with the naked eye and have yet to be counterfeited, making IR one of the most advanced security feature of today's currency.